I love that you can eat cheap in one of the world’s most expensive cities. On almost any street, you can find a dollar slice joint, bottega with two buck tacos, street cart selling chicken over rice with white sauce for a fiver, give or take. Papaya hot dogs. And of course, Chinatown’s famous five dumplings for a buck. Today, on my way to higher end dumplings at Mimi Cheng’s (six for $8), I walked by this “East Village institution” offering the classic New York meal deal of two slices and a drink for $2.75. Across the road on 1st, another pizza establishment pushing an egg sandwich with a coffee for $2. You can find these bargain bites from the Upper West Side to the Lower East Side. And there are hidden gems you might not expect, like Eataly’s Nutella Bar which envelopes you in a warm chocolate hazelnut cloud and sells a thick slab of toasted country bread obscenely smothered in Nutella for $2.80. Hole-in-the-wall Cheeky Sandwiches has a wicked fried chicken biscuit sandwich for $6.25, and Momofuku Milk Bar‘s $7 meal deal gets you a bagel bomb, snack and drink. Head to Osteria Morini on Monday nights after 9pm for the city’s best pasta for a silly $10. 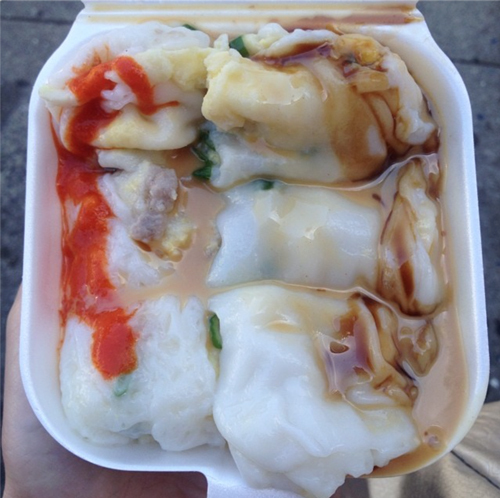 The Chinatown rice noodle lady – forget hot dogs, the cheung fun shop is NYC’s best cheap street eats. $1.75 for freshly-made pork and egg rice noodles, cooked in front of you in a tiny non-descript window, with as much peanut sesame sauce as you like. English understood but not spoken. 58 Henry St (under the Manhattan Bridge). Xi’an Famous Foods – everything is delicious at Xi’an and I’m so happy they are popping up everywhere like Shake Shack. $8 and change gets you a plastic bowl of meltingly soft beef, slippery biangbiang noodles and a deeply aromatic broth studded with Sichuan peppercorns, cilantro, cumin and other treasures. Locations in Manhattan, Queens and Brooklyn. Nine Chains – Brooklyn’s best breakfast/lunch steal is the $5 bacon and sous vide egg oatmeal bowl with squash and jalapeño. 1111 Church Ave, Brooklyn.